Remember her? Suu Kyi was the poster lady of democracy, a figure who was prematurely awarded a Nobel Prize for peace to pressure the repressive military government to pave the path for democracy. She was presumed to make things better for everyone. Even the persecuted Muslims had high aspirations about her despite her criminal silence when the Rohingya and other minority Muslims were slaughtered all over Myanmar by Buddhists in 2012 genocidal campaigns. It did not matter that in the general election that followed her party did not field a single Muslim candidate even in the Rohingya majority territories of the northern Arakan state. Her hypocrisy shocked everyone. Many pundits tried to find excuses for her saying that her decision not to field a single Muslim candidate was part of a calculated election strategy to position herself as a die-hard, serious Buddhist nationalist who is not sympathetic to the ‘despised’ Rohingya and other Muslim minorities living inside the den of intolerance called Myanmar. As expected, she won big, formed the civilian government and self-appointed herself to be its chief counsellor, a CEO-like figure overlooking the government. Unalienable rights are those which God gave to man at the Creation, once and for all, and as such, governments could not take them away. In the USA, this fundamental truth is recognized and enshrined in its nation's birth certificate, the Declaration of Independence: "[A]ll men are created equal...[and] are endowed by their Creator with certain unalienable Rights, that among these are Life, Liberty and the pursuit of Happiness." I am aware that to the offenders like Suu Kyi ‘apartheid’ is a loaded term, as she has done in the past with the charge of ‘ethnic cleansing’ against her government. But seriously speaking, how can she and her ilk duck such accusations when a comparison with Apartheid South Africa makes a very strong case for Myanmar? 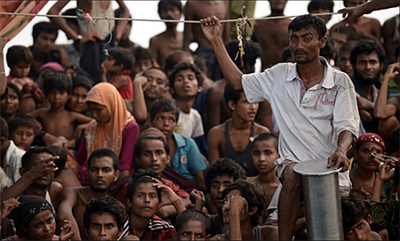 The Rohingyas of Myanmar are the worst victims of a criminal policy of economic, racial, religious, political and economic apartheid whose parallel simply does not exist in our time anywhere.